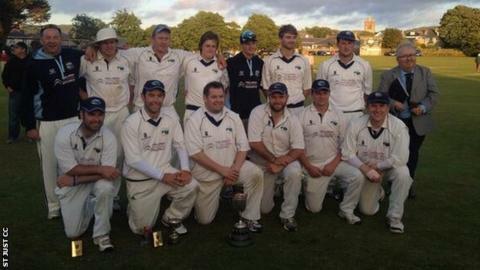 St Just claimed their fourth trophy of the summer after beating Redruth by six wickets to win the Cornwall Premier League title. They had already lifted the 50/50 Cup, Vinter Cup and WT Edwards Cup. Redruth were bowled out for just 106 as Mark George produced impressive figures of 5-21 and St Just knocked off the runs with some comfort to reach 107-4. "It's been four years without winning the title and it's been an astonishing effort," said captain Gareth May. "To win the quadruple is absolutely fantastic. Gareth has led us really well this season. We've all chipped in and won everything," George added.